Delete Guide Deletes the selected Drawing Guide(s) from the panel's guides list. Pastes Drawing Guide(s) from the clipboard to the panel's guides list. Pasted guides are inserted under the selected guide. Imports Drawing Guides from a source file and inserts them at the bottom of the panel's guides list. Duplicate guides are filtered out to avoid cluttering the list. 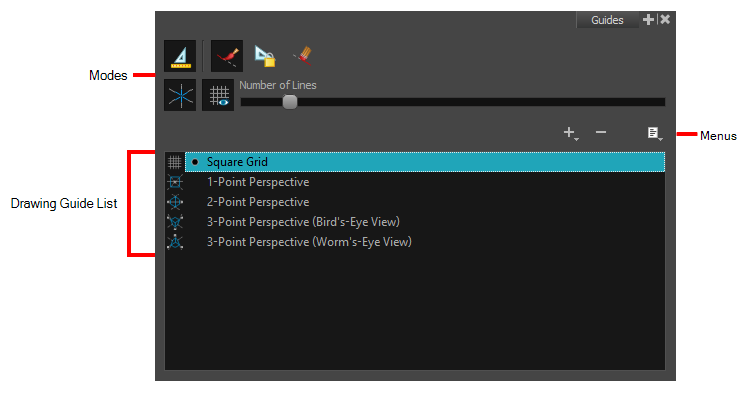 Displays the panel's list of guides and allows you to select which guide to display and use.